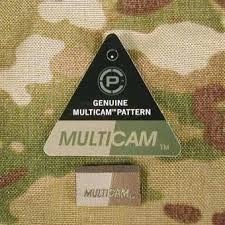 The MultiCam is currently the official military uniform worn my U.S. Army soldiers in Afghanistan and throughout the middle east. 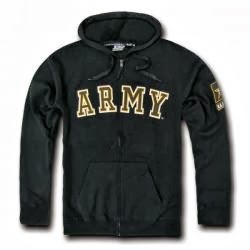 Like other military uniforms of the U.S. Army, standard-issue wear of the MultiCam uniform comes with specific regulations to improve battle-readiness and discipline of specific dress codes. The primary purpose of MultiCam uniform regulations (as well as other common uniforms) is for the evaluation, interpretation, revision, and development of acceptable military uniform and insignia dress codes that will improve the uniformity and image of U.S. Army units. 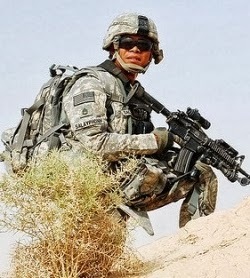 MultiCam trousers is held up by a two-inch web belt that is made of nylon, and includes Velcro pouches for inserting knee pads. The trousers must always be tucked into the top of the boots or secured by drawing the string at their bottom ends. Trousers must never extend below the third eyelet from the boot’s top. 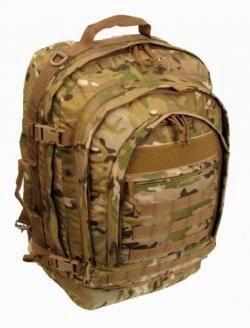 MultiCam trousers manufactured using flame resistant materials are currently standard issue for soldiers being deployed to Iraq and Afghanistan. 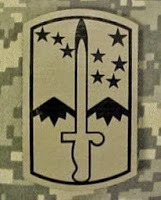 Much of the MultiCam jacket regulations focus on the patches and insignia worn on the jacket. The embroidered rank insignia is 2 inches in height and 1 3/4 inches wide. It must always be worn centered between the front hook and loop-face pad of the MultiCam jacket for all U.S Army ranks. The rank insignia’s background may be either the universal camouflage pattern or just plain olive drab, and must always match with the background of the name and the name tape. The U.S. flag patch must always adorn the right shoulder pocket flap of the MultiCam jacket. Current MultiCam regulations also require that the Army jacket must never extend below the top of the cargo pocket or go higher than the bottom of the side pocket. 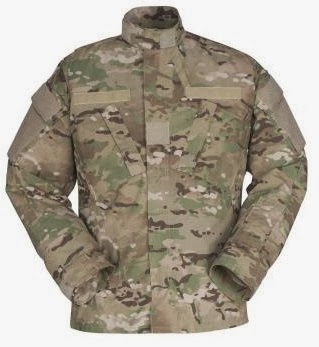 Finally, the MultiCam jacket sleeves must strictly be worn down at all times. 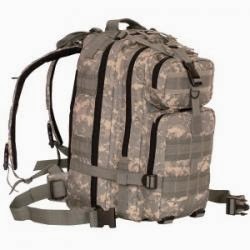 The MultiCam typically includes the Advanced Combat Helmet, a patrol cap, a fleece hat for cold weather, and boonie hat. 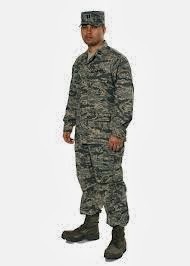 Green, maroon, and tan berets may be worn in barracks by army special forces, paratroopers and Rangers, in that order. 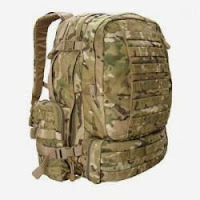 The green micro fleece cap is only allowed for use in the field and garrison outside of unit patrols while camouflage cover rank must always be sewn when worn although its use is limited because it is often obstructed by the night vision device mount. 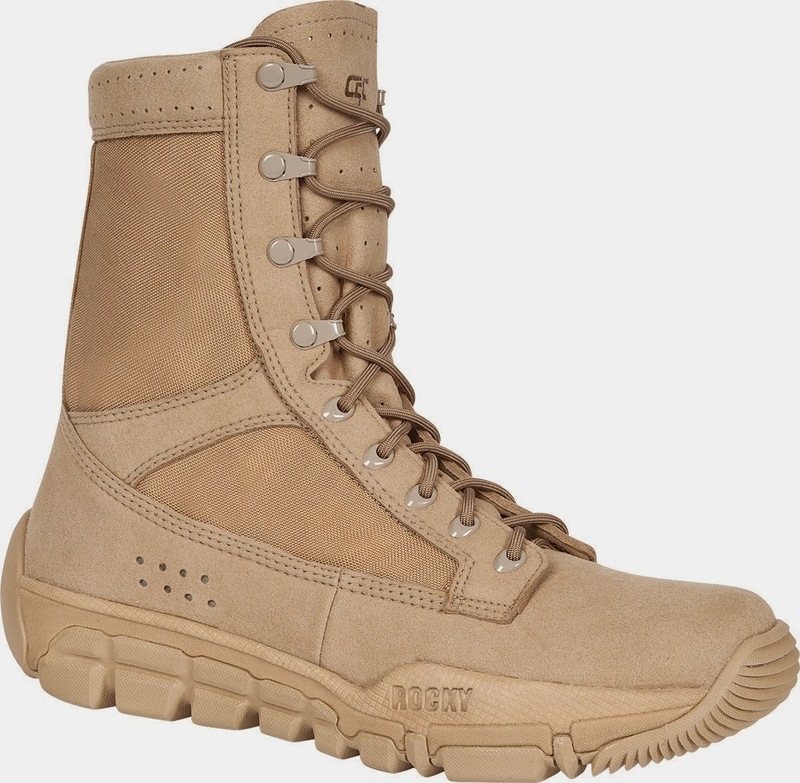 MultiCam military uniforms must be worn with a moisture wicking cotton tan t-shirt. 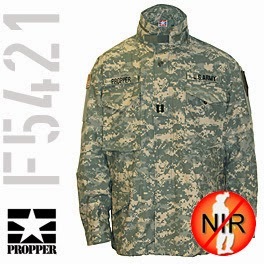 The MultiCam undershirt must be worn underneath the coat and tucked inside the trousers at all times. 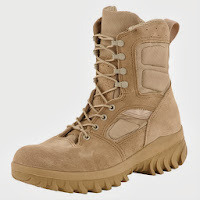 Military-issue combat boots for the MultiCam uniform must be made from tan rough side out cattle hide leather that has a plain toe and tan rubber outsoles. 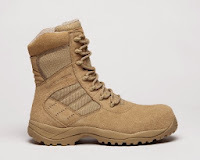 The boots must at all times be diagonally laced using tan laces, with any extending lace neatly tucked into the top of the boot underneath the bloused trousers, or securely wound around the top of the boot. 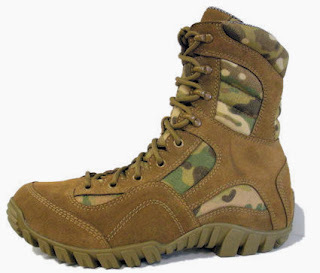 There are no metallic cleats, side tabs, or zipper tacks that are either sewn or laced in allowed by the MultiCam regulations. 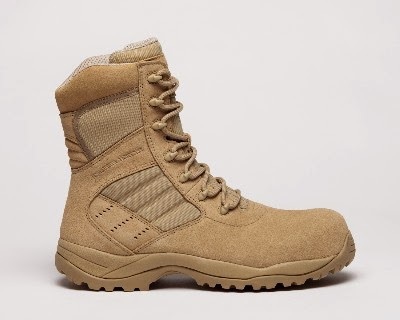 The MultiCam must at all times be worn with the official tan Army Combat Boots and moisture wicking socks. There is also a Mountain Combat Boot that is provided to cater for tough terrain and Extreme Cold Vapor Barrier Boots for walking on snow and ice. An innovative Modular Boot System is in development to eventually replace the current Army Combat Boot in the near future.